Murrays Bed & Breakfast is owned and operated by Mike and Bernadette who will ensure that you receive the warmest welcome upon you arrival. Murrays is Fáilte Ireland approved. The house sits in the tranquil location of Portumna and acts as a perfect base for visitors looking to explore the west of Ireland. The house features a Games Room and a half-acre Garden and Patio for guests who want to unwind after a hard day exploring. Free Private Parking is provided on site for visitors traveling by car. The rooms at Murrays Bed & Breakfast are bright and comfortable. There are two twin rooms, one double room and one treble room. All rooms are en-suite. Each room is equipped with TV, Tea/Coffee making facilities, hairdryer and radio alarm. Breakfast is served each morning. An extensive breakfast menu designed to suit all tastes and appetites, from full Irish cooked breakfast to cold platters, is available. Portumna with its many pubs, shops and restaurants is just minutes away for you lunch and evening meal needs. Murrays Bed & Breakfast is a few minutes away from Portumna. There are several historical sites in the town including Portumna Bridge, Portumna Castle and the Portumna Union Workhouse, which was built in 1850 to house 600 inmates who were badly affected by the lack of both employment and food. Portumna Forest Park is an excellent place to spend an afternoon and there are plenty of facilities to keep boaters, golfers and anglers busy. 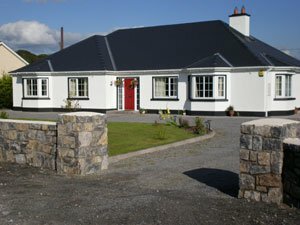 Murrays B&B is located approximately 3 miles from Portumna on the L8738. From Portumna take the R355 Portumna /Ballinasloe road. About 1 mile after the Boula Church take the first right. Continue along the lane for 600 yards. Murrays is on your left.